There’s nothing new about the bell tent, the original design has been around for more than 150 years and this alone testament to the awesomeness of this amazing simple, stunning and practical design. Growing up in West Wales we had a bell tent, second hand from the Second World War, made from thick heavy canvas, no groundsheet and a thick, wooden central pole. Now, more than 70 years old, this bell tent is still in working condition and still being used! Initially used on family road trips to and from Italy then as young girls we’d pitch the tent in the garden for sleepovers as an extension to the house in summer and as teenagers, this same tent, traveled with us to music festivals and beyond. The bell tent has been a backdrop to my life. Fast forward to Australia 2011 and wanting to adventure with a family of my own, a bell tent was the only tent I wanted, but no one was importing them to Australia! With this niche in the market, Breathe Bell Tents was born. Breathe Bell Tents was founded with the love of adventure in mind, the desire for location freedom so we can explore and travel with our family and as a service to enable others to do the same. A ‘mumpreneur’ business, Breathe Bell Tents was founded by Lucy, a mother of two boys, a passionate adventurer and camper, with a background in costume design and set production for theatre, film, TV and events and also a stint as buyer for a concept store in Milan. Operating out of Maroubra Beach, conveniently placed with green space where bell tents can demonstrated, prepped and cleaned. 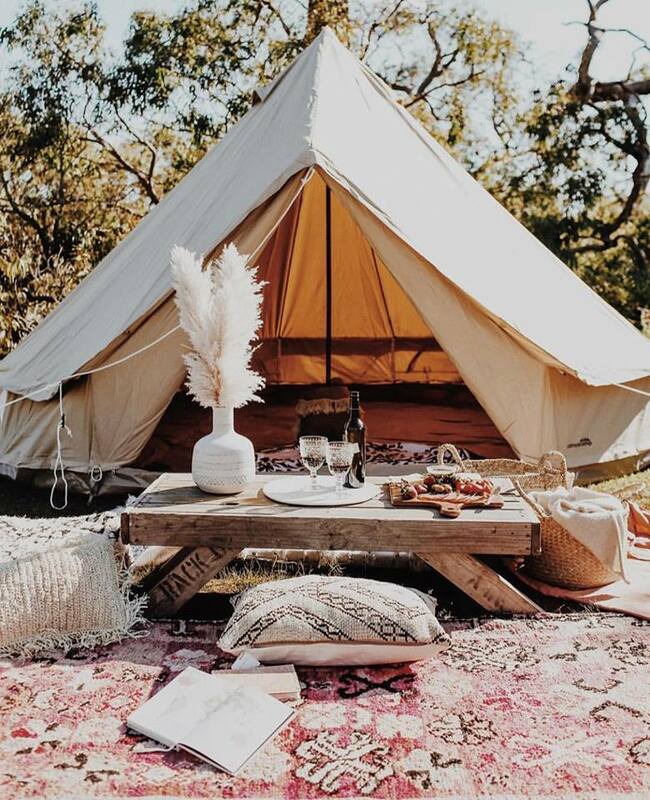 A fantastic team of contractors and a fantastic distribution warehouse, Breathe Bell Tents operates distributing bell tents across Australia and the globe. We’re passionate about our product and believe in classical, tasteful, quality, long lasting products that will stand the test of time. Our favourite moments are those spent in nature with our bell tent and our loved ones. These are the moments we cherish. The bell tent was Originally designed by Henry Hopkins Sibley, following research carried out studying the Native American Tipi in America. Sibley patented his design in 1858. Bell tents or ‘Sibley Tents’ were used by the Anzacs and the British Army in Australia during World War One. Photographic evidence suggests that Australian Sibley-pattern tents were used a great deal in Australia between 1880’s and the 1940’s. The simple conical design has evolved over the years to what it is today: a lightweight, practical and stylish tent that can be erected by one person, in less than ten minutes. Our bell tents have been rigorously tested in the harsh Australian climate. They withhold thunder and lightning, and remain watertight even after prolonged rainfall. We use a heavy duty canvas selected specifically to withstand the harsh Australian sunshine. Once you’ve sampled a bell tent you will not look back. Wonderful memories will be created for anyone who spends time in one. Our bell tents are designed to the highest of standards and our range ensures there’s a tent to suit your needs. Whether you’re heading up a river in a canoe, carrying a tent across a field to a festival, or driving onto a camp site. Feel free to email your specific personal requirements and we will assist you in your decision.